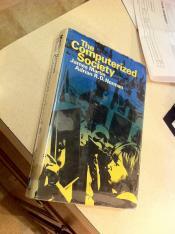 The Computerized Society (1970)I was inspired to do my first solo Armchair Arcade Radio audio podcast by a 49 cent book from 1970 that I received in the mail from Amazon today. As you can imagine, this was not just any 49 cent book from 1970, but James Martin's and Adrian R.D. Norman's, The Computerized Society. As mentioned in the podcast, I first learned of this book here. Take a listen to why I think it's so special by playing or downloading the audio file attached to this post, or simply visit iTunes and look up the charmingly misnamed "Armchair Arcade Radio" (it also features videos), or use your favorite podcatcher. Enjoy. Hi, folks. I'm back this week with another podcast, this time discussing my game pitch for "The Time Police," a project I've been brainstorming and planning for some time. It still has a long ways to go, but I'm excited enough about the idea to want to make a podcast about it. If you have thoughts or suggestions, please let me know. Matt Chat 118: The Dagger Has Fallen and It Can't Get Up! Still, the resulting misadventures are pretty darn funny. Matt's Podcast 4: Can a videogame get you high? Turn on--the gameThis week, I address a question that I'm sure we've all pondered at some point--are videogames really addictive, and, if so, is that necessarily a bad thing? I'm particularly interested here in what it would take to design a videogame that would "turn you on," offering a comparable experience to taking LSD or even peyote but without the potential side effects. How close are we to developing true digital drugs? Will you be the Albert Hofmann of videogames? If you enjoy this, please post a review on iTunes. Does Compute!I'm back this week to talk about the Five Games Every Designer Should Know. Read the blog post if you missed it. There's also quite a bit of listener feedback that covers such topics as why Icewind Dale and Neverwinter Nights aren't as good as Baldur's Gate, and why Portal isn't as unique as some people like to think. Enjoy, and feel free to comment below. Who knows, perhaps your comment will form the basis of my next episode! Grab the episode here: Matt Podcast #3.mp3. Post a review on iTunes. Be sure to listen to Chris's episode first.